Some subjects move so quickly that the human eye normally could never observe them. However, a very fast shutter speed can freeze a moment in time. Falling water, a breaking light bulb, a bullet penetrating an apple, and other events that are over in an instant lend themselves to hyper-freezing techniques. 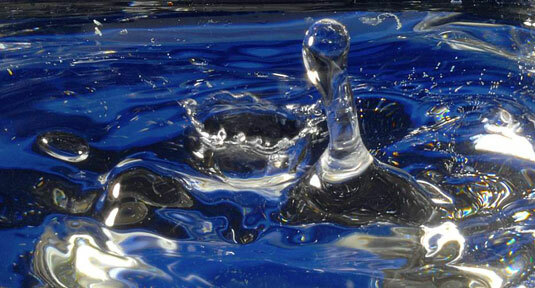 The figure shows the ripples and splashes produced by a drop of water landing in a glass. It is illuminated by placing an electronic flash off to the left and triggering an exposure manually. This method involves a lot of trial and error, but when you use a digital camera, you can easily take 30 or 40 pictures to get the exact one you want. Most digital SLRs have shutter speeds of at least 1∕4000 of a second; some have speeds of 1∕8000 to 1∕16000 of a second. You can get even briefer shutter speeds by taking advantage of the fleeting duration of an electronic flash unit when you use it in Close-Up mode. Many strobes wink on and off in as little as 1∕50000 of a second when you use them up close. That’s because only a very quick flash is needed to properly expose an image from that range, but you can use the effect to stop action. If you want to try freezing action by using an electronic flash, use one that you can operate off-camera, connected with a cable. Or try mounting your camera on a tripod, darkening the room, and shooting a bulb exposure. During the exposure, trip the flash manually by pressing the Test button. Because the room is dark, the camera uses only the illumination from the flash for the exposure. Some flashes enable you to reduce their power output to produce even shorter durations.